Dr. Kukadia attended Northwestern University for his undergraduate degree in Industrial Engineering, then earned his medical degree at SUNY-Syracuse in 1991. His surgical internship was at SUNY-Syracuse from 1991-1993, then on to the University of Minnesota Medical Center where he completed Urology residency in 1997. Dr. Kukadia is certified by the American Board of Urology. 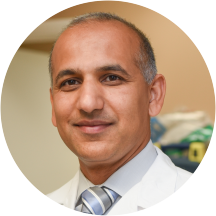 Dr. Kukadia is on staff at Good Samaritan Hospital in West Islip. Dr. Kukadia has been involved in research studies in urology and has been published in The Journal of Urology. Dr. Kukadia is a member of the American Urological Association, American Medical Association, and the Medical Society of the State of New York. Recently I needed to go to the hospital for pain in my urinary tract. The doctor there prescribed a child dose of antibiotics, which caused the infection to become very painful a day after I finished the antibiotic. I returned tothe hospital the next day, and the staff doctor could not find the infection. The staff Doctor ordered I be given pain killers and sent home. I looked up and saw Dr. Kukadia walking thru the emergency room. he came to my gurney and asked what was going on, he had been informed that I had returned to the hospital a mere week after my first visit. And He was concerned. he read my chart, had other tests done that showed my infection and told the staff doctor what medicine to give me. I'm better because he cares about his patients. Nice office, friendly staff and most importantly very good doctor. I liked his open approach and he has a pleasant bedside manor. This was my first visit with Dr Kukadia. He is very professional and I think he's an excellent doctor.